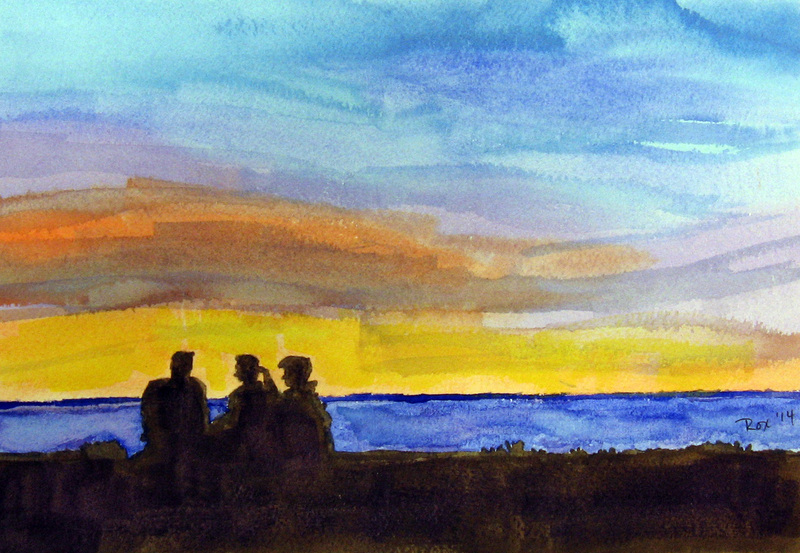 This is another ink and watercolor. I used frisket and inked lines with a #4 round brush this time, prior to spritzing it with water as in the elephant. After all that dried, I washed in the colors. 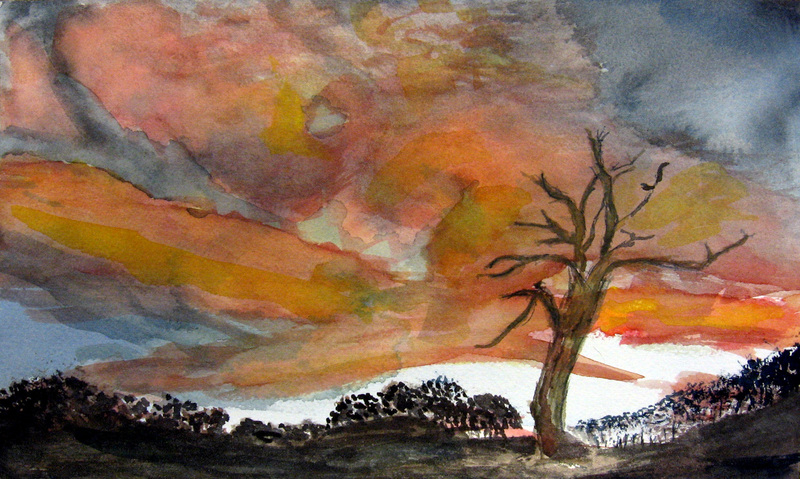 I then removed the friskit and went back in with watercolor and ink. The last thing I did was splatter with a small rigger. 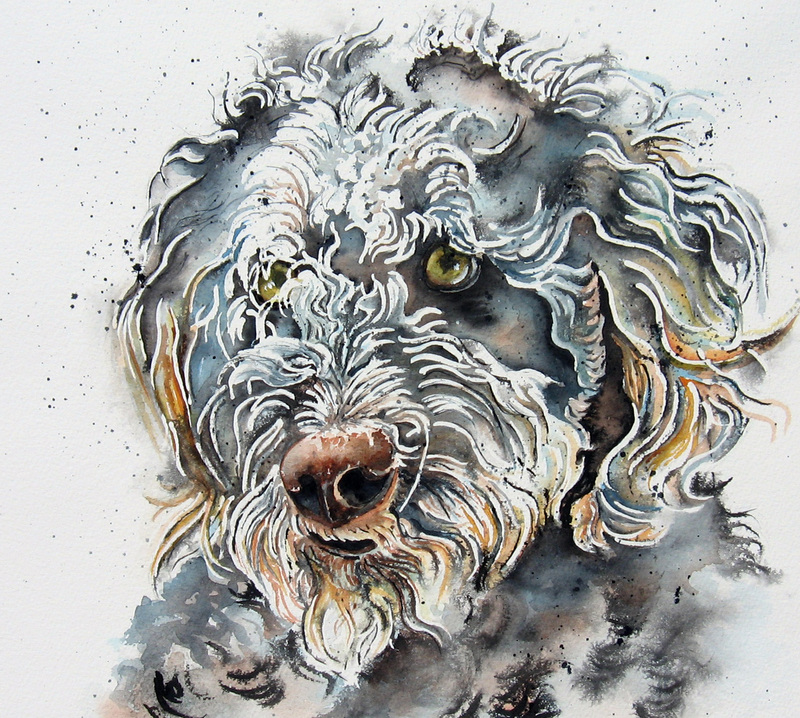 Thank you to wet canvas for the beautiful reference image of this dog. 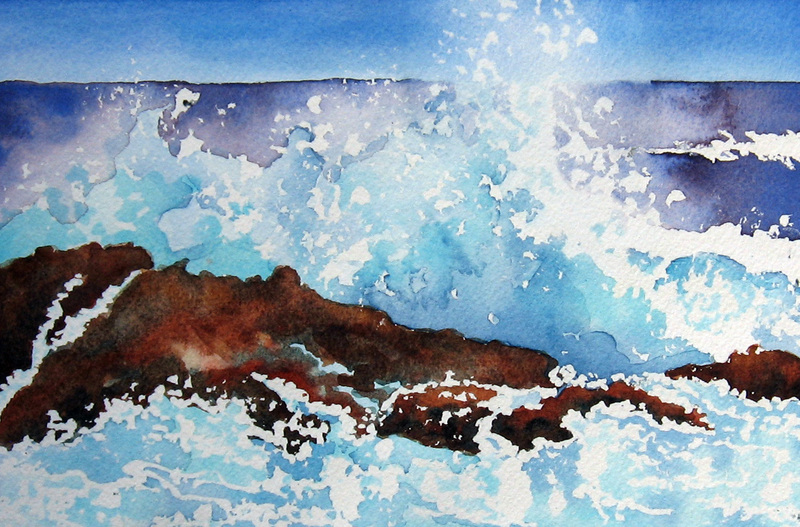 I have painted this wave once before on masa paper here. This time I wanted to try something a little different. 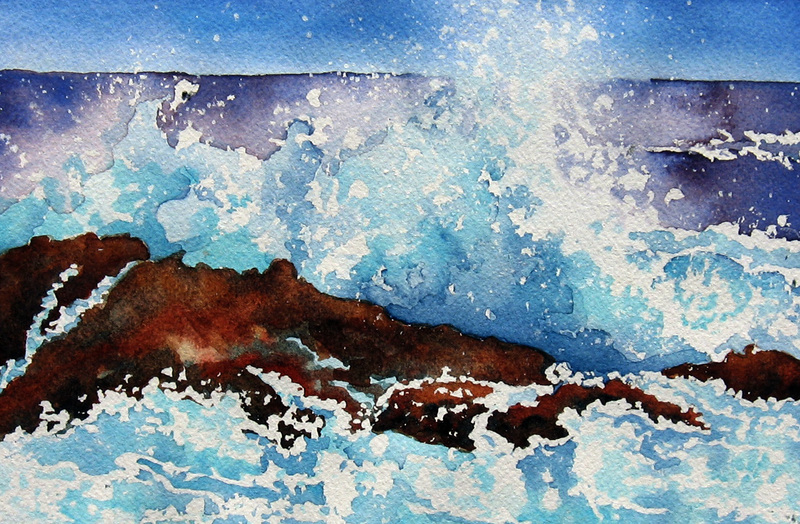 I had read in a book titled “Terry’s Top Tips for Watercolour Artists” (by Terry Harrison) that he sometimes uses a sponge to create the white foam on the tops of waves or I think they are sometimes referred to as whitecaps. 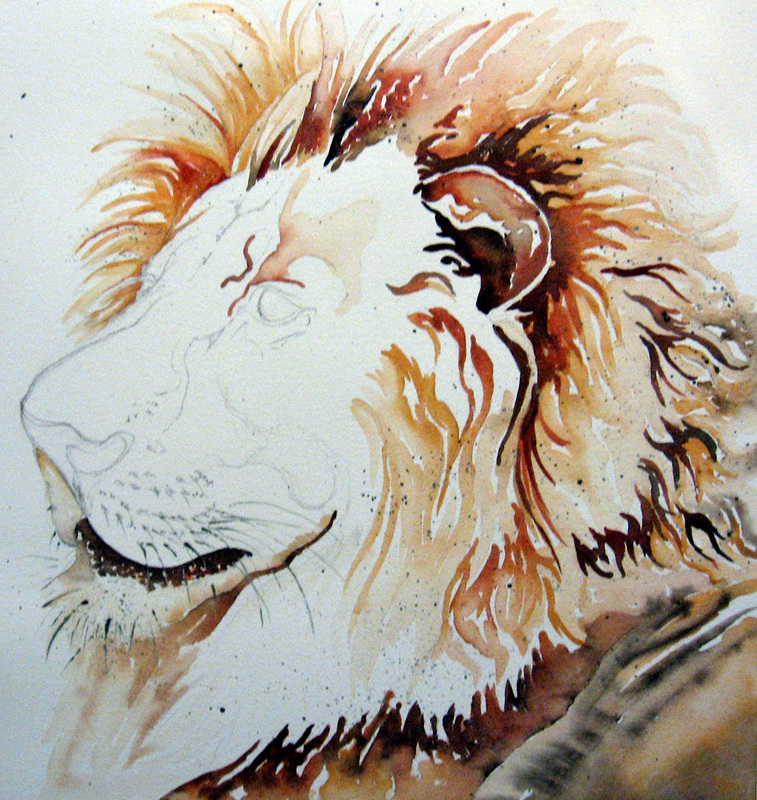 I have outlined how to use liquid frisket with a brush in another post here. Using the frisket with a sponge is much the same. Left to right are my frisket supplies. 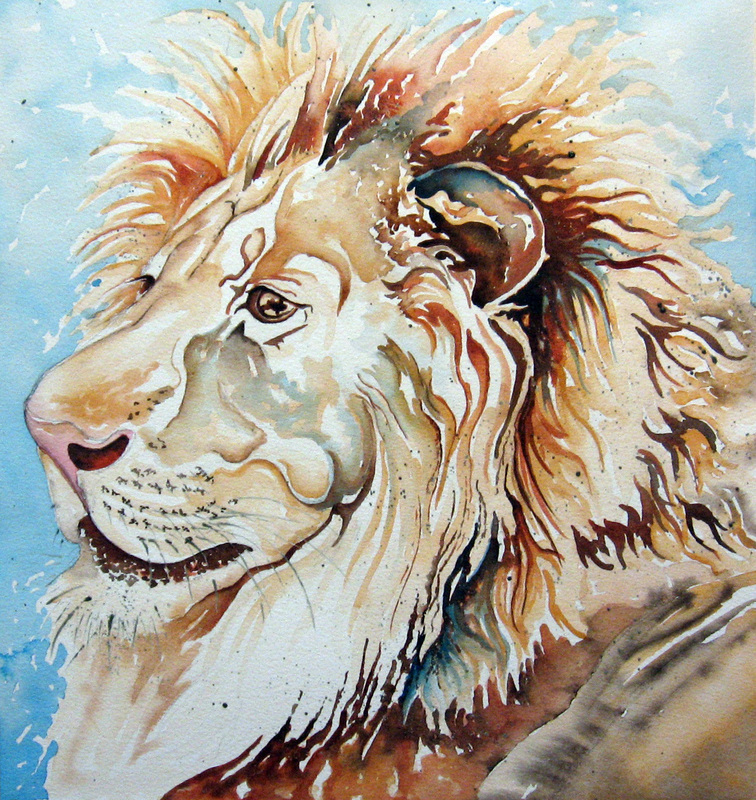 Frisket can be referred to as masking fluid or drawing gum, also. On the left is my rubber pick up. 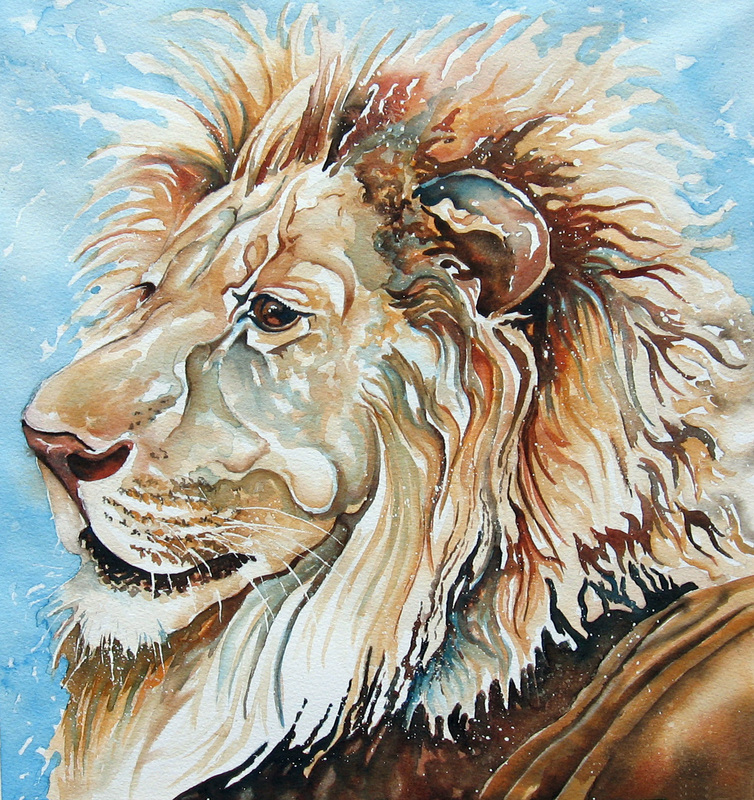 This is used after your painting has dried and you need to remove the frisket to expose the white of the paper. You do so by carefully rubbing this across the surface. It removes the frisket much like an eraser. I have two kinds of frisket in the photo. The incredible white mask is pretty thick and I only use that when I am not too concerned about exactness, like for splattering and such. The other is Pebeo Drawing Gum. This is my favorite. I like it because it is runnier and easier to work with when using it for tiny areas that need more detail. Next is a small jar of brush cleaning soap and last is my frisket brush. 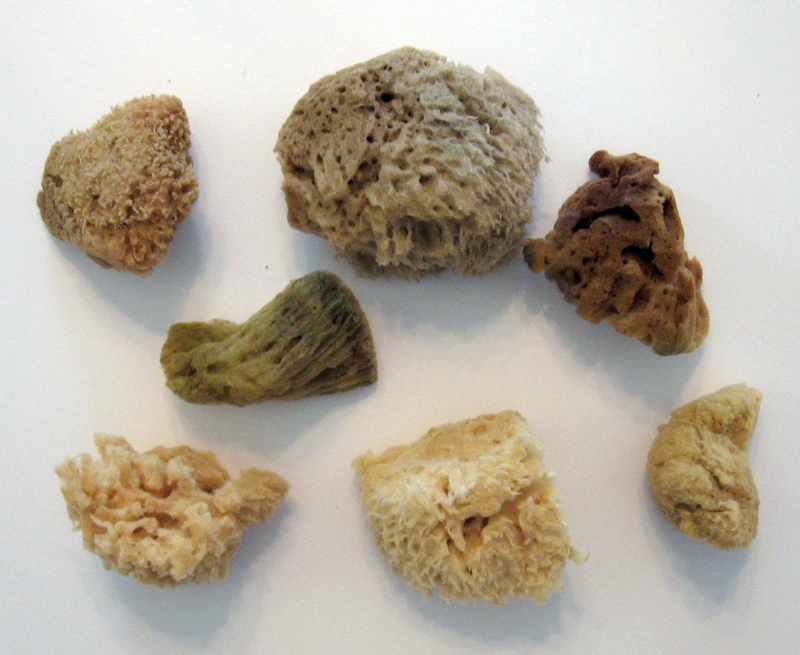 Above are examples of some of the sponges I have used. When I purchase sponges, I try to look for new shapes to add to my collection so I get a variety. 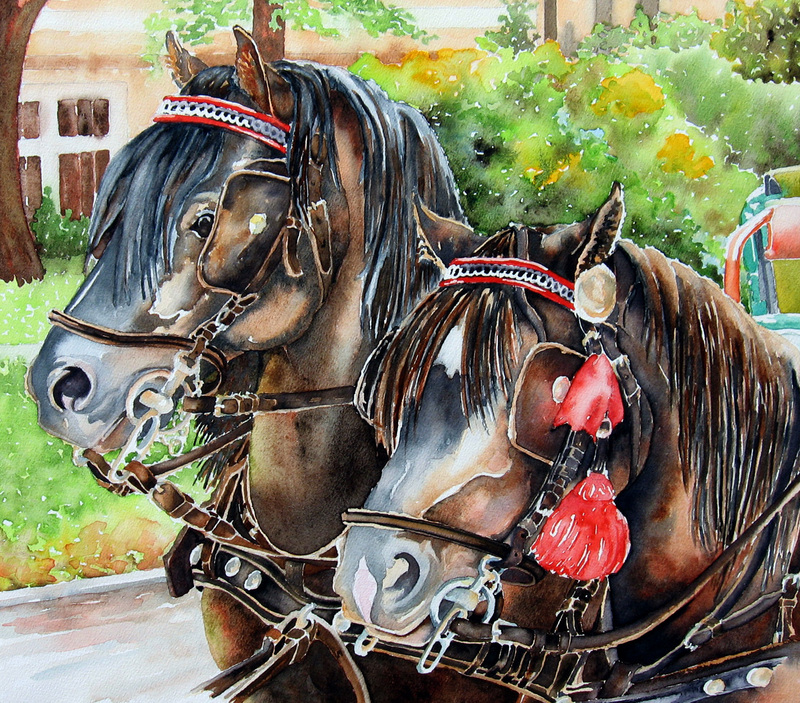 The large one in the center top is the one I chose for this painting. I tested several on scrap paper to see which one would be best suited for what I needed for the white shapes on the wave. 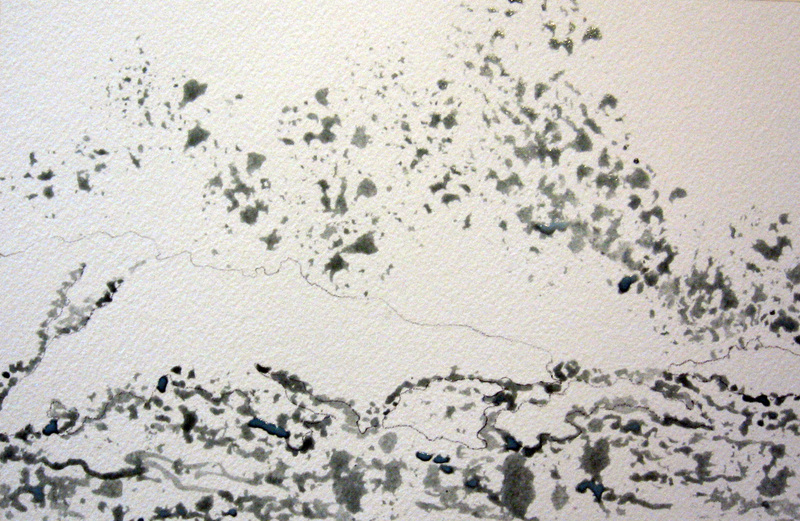 I began by drawing a guideline or two for the rock shapes on my watercolor paper (140 lb Arches Rough). I then prepared my sponge by dipping it in water and allowing it to become soggy. I squeezed out as much of the water as I could. This makes the sponge “thirsty and ready to work. I spritzed some water onto my soap dish and dipped my damp sponge in that first. This makes the outer surface of your sponge shapes a little slippery and will help you get the frisket off when the time comes to rinse. I then dipped my sponge in a puddle of frisket that I poured into an old dish (small to not waste the frisket). I began dabbing the frisket on the contours of the wave, emulating what I saw in my reference photo. I am very careful to rinse and repeat these steps so the frisket never begins to dry on my sponge. I used the sponge for some of the foamy water in the foreground, also. I immediately rinsed my sponge out when I finished so the frisket did not dry in it. 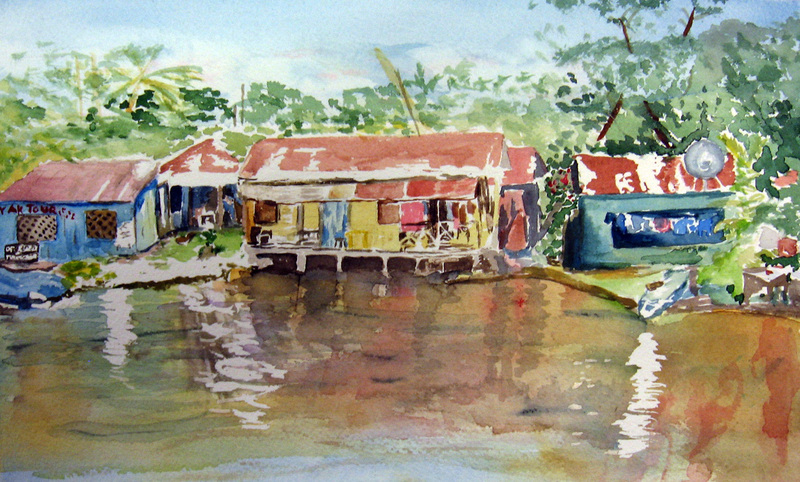 I have read about a landscape artist who allows the frisket to build up on sponges and old brushes and he re-uses them. He gets some very interesting textural effects with these. 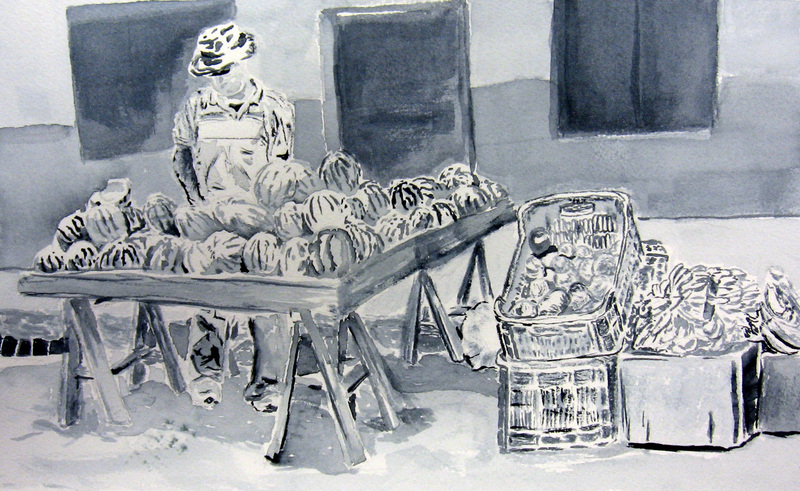 I used my brush and more frisket in the foreground to paint in some of the lines and roiling shapes I saw there. Before continuing, I wait for the frisket to dry. 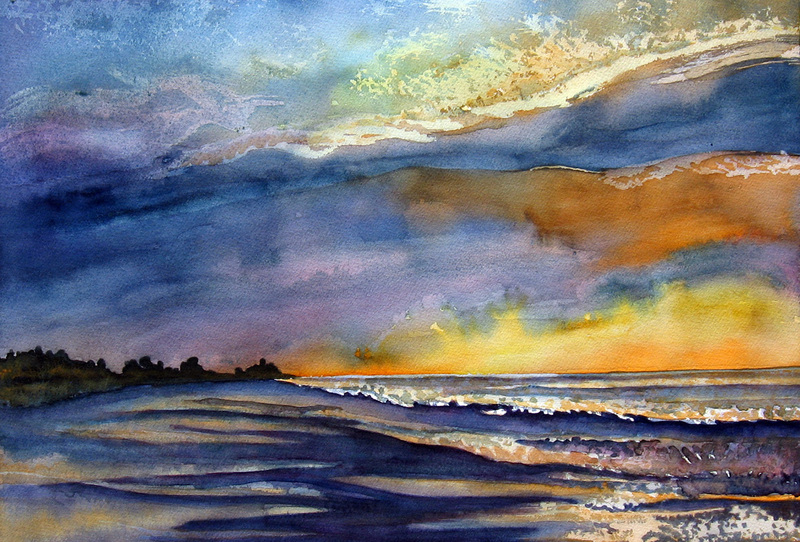 Next, I chose several blues and painted the sky and the shadow shapes in the waves and allowed that to dry. 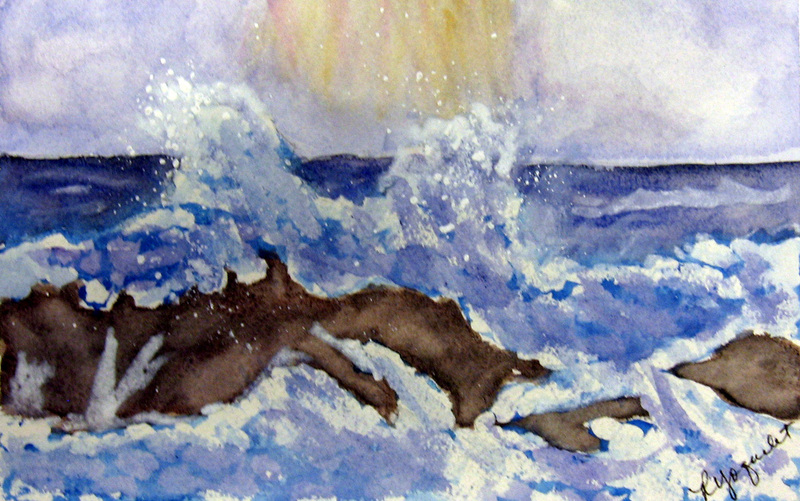 I mixed a darker blue for the ocean behind the wave and painted it in very wet. Note the lighter areas around the wave that look kind of foggy. Prior to the dark blue wash drying, I dabbed around the top of the wave with a tissue (non-lotion tissue) and softened the edges of these foggy shapes. I painted in the dark rocky forms with dark earth-tones. I allowed the painting to dry again. I removed all the frisket ; rubbing the surface with the rubber pick up. 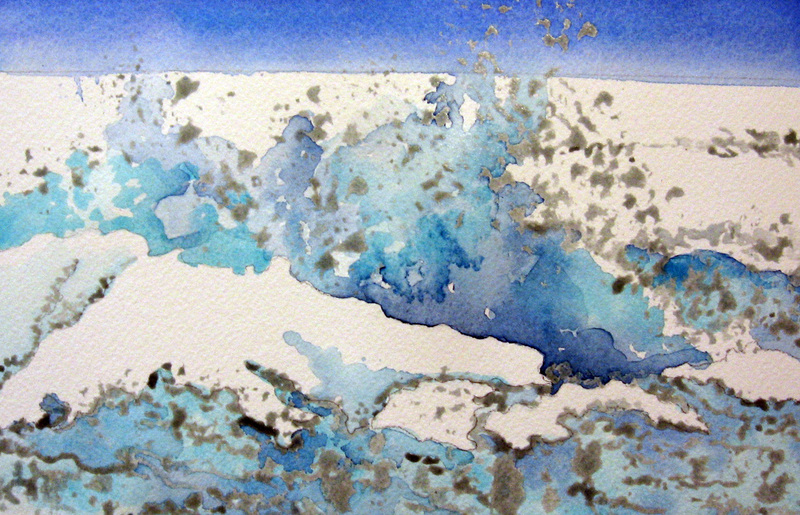 I finished by darkening some of the blues in the foreground and in the darkest areas of the wave. 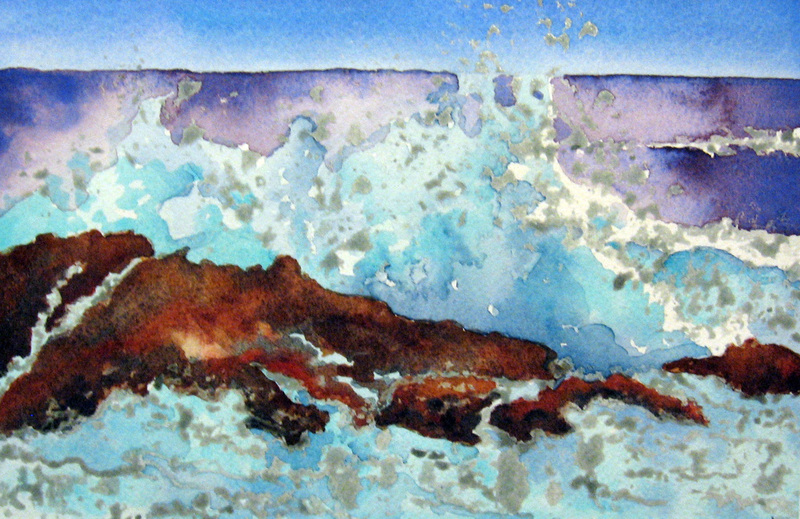 I splattered the top of the wave using a small #4 round and white gouache. Thank you to wet canvas for the reference photo for this. Happy New Year to all of you! Thank you for following my blog over the years. I enjoy visiting you and seeing your work and learning the new things you are exploring. 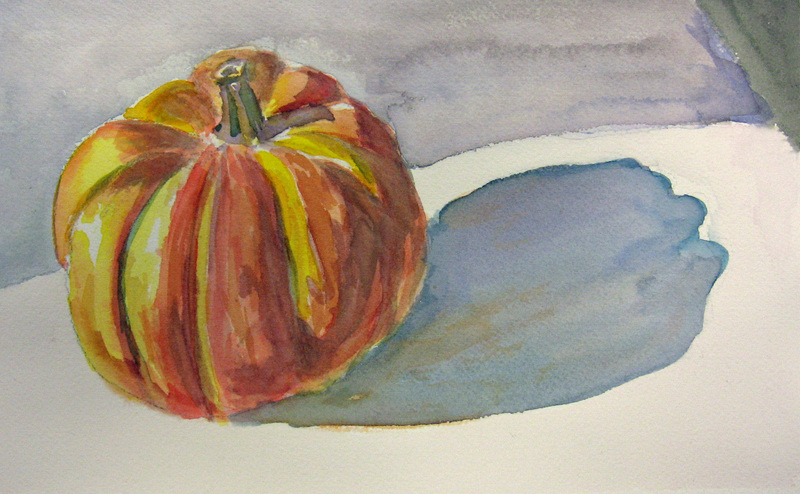 We began our class with an introduction to brushes, pigment and paper. 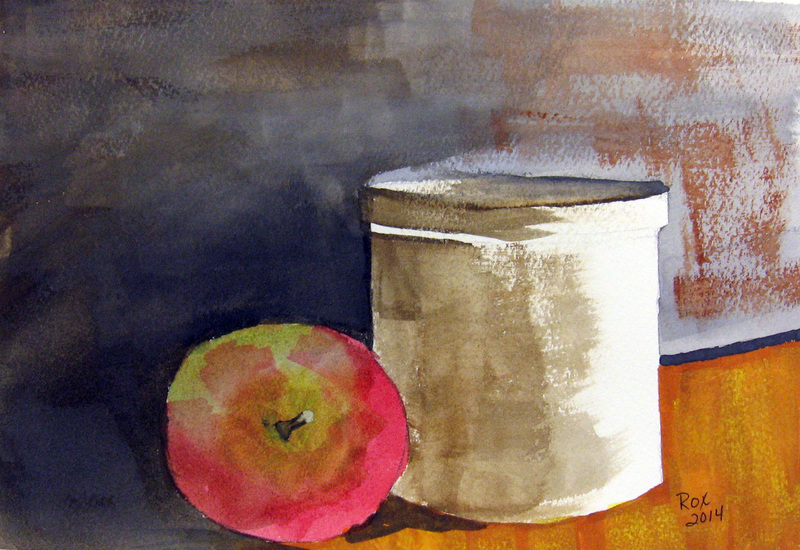 We practiced washes and glazes and were introduced to three ways to apply watercolor (wet in wet, wet on dry and dry brushing). We talked about different color combinations and practiced painting some of them. 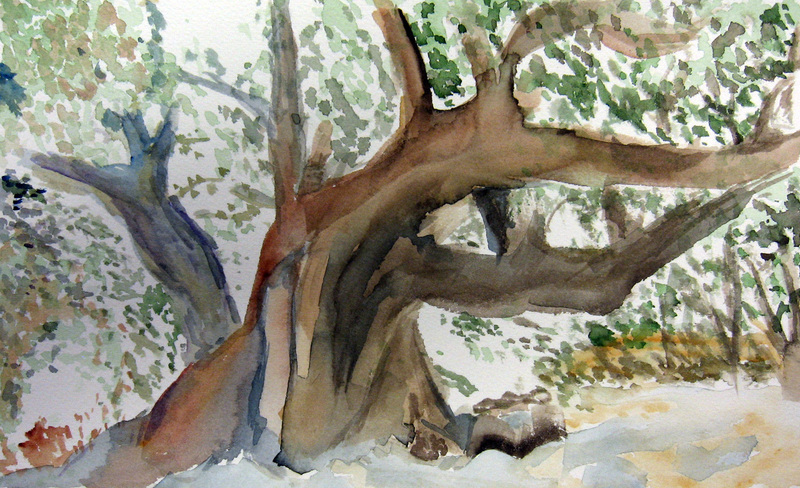 In the third class it was all about trees and foliage and the different ways (sponge, pointillism, scumbling, salt, frisket) texture could be rendered in watercolor. 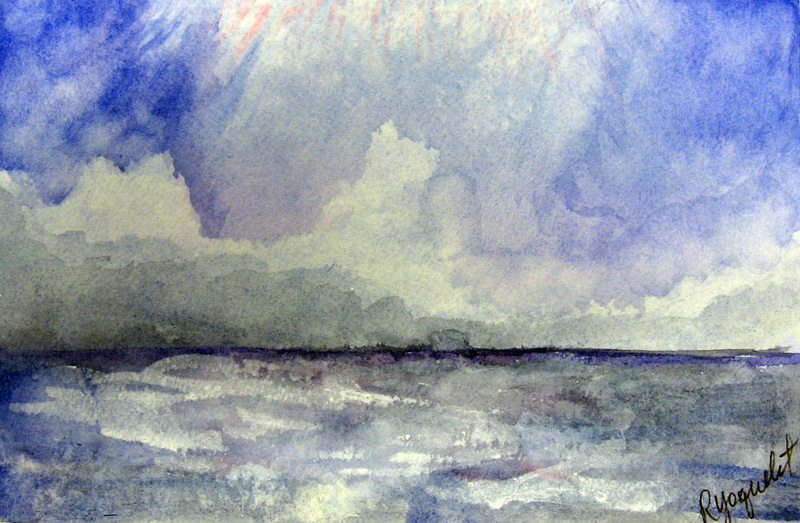 Then it was on to “Big Sky” and “Big Water” and how to allow the water on your paper to mingle color. 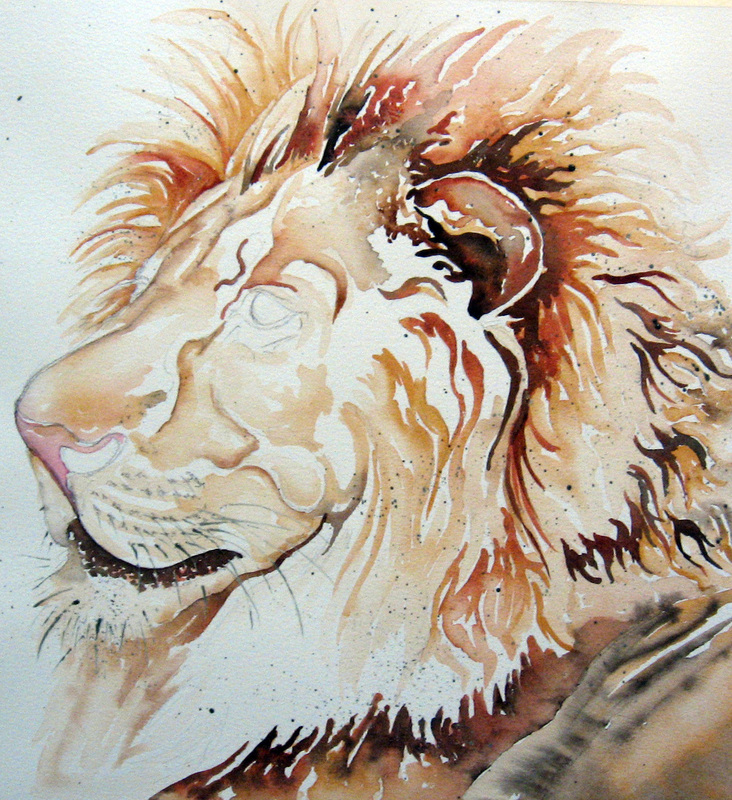 How to splatter and how to let go of the reference material a little and allow the water to help create the painting. On the fifth week, we discussed buildings and perspective and that they were composed of a collection of shapes that fit together. I was knocked off my feet when I saw the two paintings, above! What beautiful work after only five weeks. 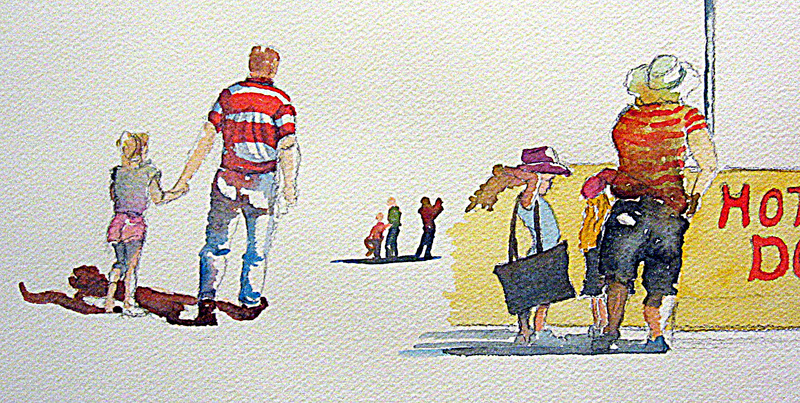 On the last night of class, we practiced painting “little people” to use in our landscape paintings in the future. 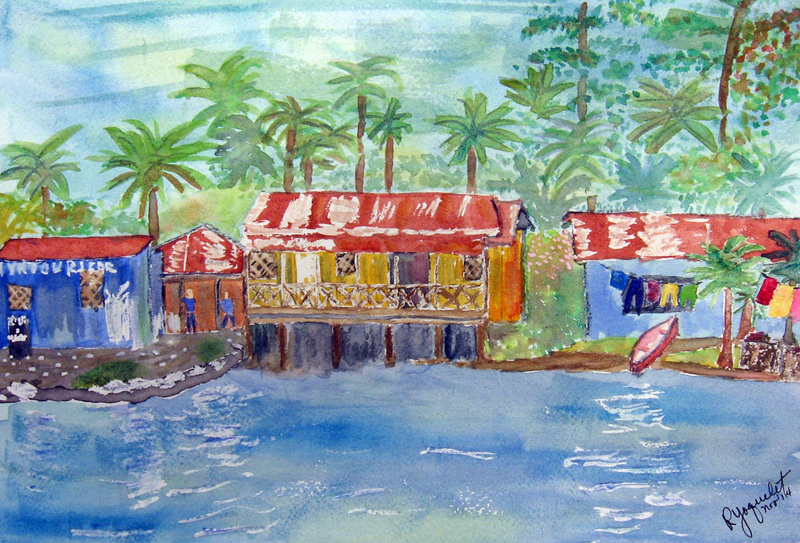 A huge thank you to Roxanne and Laura for giving me permission to share their paintings with others. It has been so long since I’ve posted. I don’t know where the time has gone. 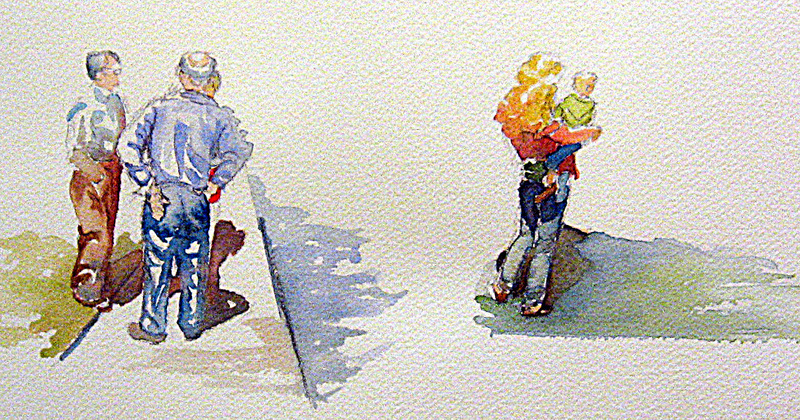 I did start my 2014-2015 art classes, so perhaps I am just a bit slower this year. The above is a repeat attempt on a pony team I first painted here. I wanted to paint it in color. Thank you to wet canvas for the photo reference.